Responses are still coming in from our last post. We have posted some of them below. For those of you who may wonder, the Board of Trustees meeting went exactly as we predicted that it would. Though we hoped for someone to stand up and ask the hard questions, no one did. The Pied Piper played his siren song, and like the rats over the cliff, they followed mindlessly along. The enrollment is fine, Shorter is in excellent financial condition, donations haven’t dropped and we’re in the NCAA – Go Hawks! Many of the board members have been on the board a number of years. They have in their possession the statistics from years past. It is their responsibility to do their own statistical comparisons. It is clear to us that they did not, nor did they avail themselves of the statistics we have presented on this site. We have to ask why, when questions are posed, when students and faculty leave in such large numbers, when enrollment numbers are demonstrably down and when donors walk away from an institution which they have long supported, the Board of Trustees would desert their responsibilities to the institution they have vowed to sustain. Is loyalty to the GBC more important than their duty to Shorter University? It appears that it is. To the Shorter Board of Trustees – we hold you personally accountable for your actions or lack thereof. To our friends on the Hill who suffer in silence – we are with you, we pray for you and we will not be moved. I think that my first experience at Shorter typifies my 6 years there. I was sitting in my office working on preparing my lab manuals and getting things ready for the first week of class when two students walked in and set down. Coming from big schools where students didn’t really interact with the professors often, I assumed they needed something and asked if I could help them. Their response was “Nope. We work for you. And we’re probably going to hang out in here so we figured we’d get to know you.” From that day until the day I said my goodbyes, my office was a revolving door where students not only came to have the material clarified, but to laugh, to cry, to discuss their lives and their beliefs. I will treasure the friendships I made there. From students to my fellow faculty…I made lifelong friends who have influenced my ability to teach and have enriched my life by sharing theirs with me. I know that God has taken this “mess” and turned it around for me. I am blessed to be at a school where my administration supports me and where my opinion is valued. I am appreciated for my ability to teach and give my students the academic rigor they deserve and I am not asked to give up the integrity of my classroom. But my heart aches for those left behind…students, faculty, and staff…that must now endure a Shorter that is not like the one I was fortunate enough to find in 2006. It was an incredibly special place. October 24, 2011 was the first day of the most difficult year of my life – professionally, personally, mentally, physically, and spiritually. Just 7 months after a fantastic job interview where I was offered a job at Shorter and just 6 weeks after that job began, I was informed via email that my faith was no longer acceptable, that my love for my gay friends and students was no longer acceptable, and that the foundational theories of my subject area (Biology) were no longer acceptable. The Hill changed that day. Faculty were distracted, students were confused, and our personal safety was even threatened. So, six weeks after beginning a new job and eight weeks after moving 900 miles, my life was thrown into complete turmoil; however, despite all of this we taught, we formed relationships with our students, and we represented Christ. We constantly heard “If you don’t like it leave” straight from the President’s mouth, but we still taught. We spent late nights preparing job applications or worrying over finances, but we still mentored. We cried and screamed at home, but we still took our students on field trips. We went to counseling or saw our doctors because of the stress we were experiencing, but we still gave a listening ear when our students needed it. Eventually many of us accepted new jobs and moved away, but do you know what has happened? We are still mentoring and supporting our Shorter students. Our students are now experiencing a complete lack of leadership and they have lost the experienced faculty they love and trust. In the place of the departed faculty are inexperienced individuals who are unavailable to students, accusatory, and lacking in knowledge in their subject areas. How does this benefit the students I love? I have had a difficult time recovering from the past year. My body and my spirit have taken a toll that I never thought possible, but I cannot say that I regret my year at Shorter. I met colleagues who quickly became some of my best friends, I was mentored by truly amazing teachers with a wealth of knowledge and experience, and I had students who truly desired to learn and use their knowledge to advance the Kingdom. Thank you SOS and my former colleagues for continuing to the fight the good fight. Please know that while some of us may no longer be on the Hill with you that you are never far from our thoughts. On October 24, 2011 (one year ago), the administration that had assumed control of Shorter released a group of documents pushing a controlling and fundamentalist agenda under the pretense of “bringing Shorter back to its Christian roots,” which it had never left in the first place. This precipitated the massive exodus of dozens of faculty and staff, many of whom had intended to remain at Shorter for life and many of whom had already been there for years, as well as the massive transfer of dozens of students. To those who have been scattered abroad, and also to those who remain at Shorter working at the attempt to restore the decimated performing arts program: you are in my thoughts today. Kyrie eleison. One year ago today, a fundamental (no pun intended) series of events began to unfold in my life. Dear Shorter University – thanks for pushing me out the door so that Reinhardt University, with all of its magnificent students, faculty, and staff, could welcome me with open arms. I’ve made friends for life. There is no doubt I’m where I’m supposed to be. UPDATE: THESE COMMENTS JUST IN. If you have a submission, please send to saveourshorter@gmail.com. Thank you. One year ago, I went to a meeting at in the Chapel at 4pm in the afternoon. I was prayed at, prayed over and sarcastically thanked for my years of sacrifice and service. Then I was told to go and watch for an email. An email: That is how we all found out that Humpty Dumpty was falling down. This has been the most tumultuous year of my academic career. Watching students who once thrived in their scholarship start to wane and wander – dazed and confused. Listening helplessly as students told me of suicide desires and attempts. Seeing cut marks on a student who seemed to always have it together. Experiencing breakdown after breakdown in classes – wondering how parents would react if they knew this needless suffering. Encouraging students to go to counselors and understanding when they feared any notation on the records. Watching students go in vain to the administration with concerns, questions and ideas – thinking they had a real chance at reconciliation. Watching my colleagues was a different matter entirely. I never knew the stages of grief until I watched so many go through each stage. Watching as back-up plans became amazing opportunities for them. My God is a mighty warrior and He will smite those who persecute others and work evil in His name. The continued hypocrisy is astounding: “Pretend to be what we say we are, not what you see for yourself.” Believe me. It does not go unnoticed by the students. There is an air of pseudo-positivity met with smiles of under-qualified and fresh out of the classroom colleagues who are alienating students who know to expect more. I have to wonder now how parents reconcile spending their hard-earned money to send the children to Shorter. There is another faculty and student exodus coming. It will not include me. I refuse to be scared away from the Hill that I have come to love. I am encouraged to continue to go to the Hill everyday and continue to be a rock for those students who remain. I refuse to give up my home and community but understand those who felt compelled to leave already. Every day I wonder: when will the Board of Trustees wake up and take on the responsibility they committed to so eagerly. When will they realize their responsibility to these students which is much more important than the prestige they think they have. Are they even aware of the continued troubles on the Hill? They seem to be much more concerned with their delusion of what Christ-centered education means than the academic experience of our students. They are here this morning on campus. I will smile broadly when I see them – maybe even wave – then pray for the Lord to work a miracle on the Hill. My time at Shorter was not as long as many others. I was a student from fall 2006 through spring 2009. I then worked full time from fall of 2009 through April of 2012. A total of about six years. I never got to experience Shorter before the days of the GBC takeover of the Board of Trustees. What I do know about is the transition of Shorter from a great place to work to a life draining home of the “frozen chosen.” When I first came to Shorter, it was generally a peaceful place where ideas could be shared without fear. People of liberal and conservative beliefs could come together in harmony . Now you cannot work there if you do not have the right brand of Christianity.I had Christian education from middle school through college and I have learned that such rejections of people because they believe a different way only creates hate. The Personal Lifestyle Statement pretty much says that if you are homosexual or drink alcohol that you are not the right brand of Christian. The administration of Shorter has given young people the impression that people who do not believe the same way are inferior. I remember a teacher telling me about how two of his students were berating homosexuals in class. The students have been given a license to hate others. Love would be accepting others even if you do not agree with them. If Christ wants us to love our neighbors, how much more are we to love those who disagree with us? My name is Bolling Thompson. I taught in the Department of History, Political Science, and International Studies for 3 1/2 years ending in 2010. I resigned as a matter of principle in response to many of the issues that later intensified as reported in SOS. My years teaching on the hill were very enjoyable. I found the academic community to be stimulating and the students to be receptive and a pleasure to teach. I look on the experience as one of the most rewarding of my life. I am pleased to be able to keep up with a number of my students and former colleagues. In the midst of this wonderful academic environment I became increasingly aware that its foundations were being slowly eroded by an insidious assault from very rigid members of the Georgia Baptist Convention. Like many, I tried to ignore the gathering clouds of academic and personal intolerance. I saw concern, distress, and even terror in my colleagues as they contemplated the ultimate implications of what the takeover by the GBC would mean. I became increasingly concerned about the fate that awaited Jewish colleagues not to mention Gay and Lesbian members of the community. Many of us hoped common ground could be found with the GBC to honor the Christian Gospel as well as personal and academic freedom. My whole life I have endeavored to be a follower of the Lord Jesus Christ. I mistakenly thought that since I followed the same Lord Jesus as the GBC that some positive resolution was possible among people of good will. Sadly, I came to the conclusion the GBC was intent on undermining all the good things that Shorter represented. As a professional I could no longer associate my name with an institution that was not committed to academic freedom. I realized that the GBC regime was intent on materially hurting fine teachers and administrators. Many of these individuals had given their whole working lives to the cause of Shorter and its students. I was lucky that my financial status allowed me to make my small protest and resign. I regret that my leaving and all the sacrifices made by others seem to have had little effect. However, I do believe that ultimately it does make a difference when people stand together and speak the truth. I can only hope that one day Shorter will become again the wonderful place of light and learning that it was before. SOS has my respect and support. On the eve of the Fall 2012 Shorter Board of Trustees meeting, we would remind the Board of what has transpired over the past year. We would like to think that someone, somewhere, is listening. On October 24, 2011, Don Dowless and Nelson Price announced that at the Board of Trustees meeting, which had just recently occurred, the trustees had voted to approve a set of three documents – a Personal Lifestyle Statement, a Statement of Faith and one document entitled “Biblical Principles on the Integration of Faith and Learning”. The bombshell of those documents reverberated through the hallowed halls at Shorter and the Hill as we knew it began to crumble. What they did not tell the public is that this was a hastily crafted set of documents, not drawn up by the entire board, but only a select few – with the help of outside churches and the GBC. They also failed to tell the public that the entire board had only received the documents a few days before, with their board packets and were not given the opportunity to review or discuss them. Over the ensuing year, the Provost, who had been pressured into agreeing to the statements, has been demoted, the paper gun that was the Personal Lifestyle Statement was held to Michael Wilson’s head, and the trigger pulled, the faithful Shorter graduates who had begun leading the Alumni Department so ably were summarily dismissed, two Mormon employees were told that their religion wasn’t acceptable to the “new” Shorter, the Vice President of Student Affairs and Dean of Students who had listened to the pleas and cries of the students was banished to the Atlanta campus, a beloved administrative assistant of some 22 years was told she was not a “team player” and was fired. Some 90 individuals have felt it necessary to leave the hypocrisy and bigotry that now rules our beloved Shorter. The University has hemorrhaged students from the CAPPS program and the traditional students on Shorter’s Hill. On the anniversary of the full take-over of a college/university that has stood for over 100 years, an interesting thing has happened. Those who truly cared for and understood what Shorter has meant to the world began to send comments, reminding all that we have not forgotten, and that the true Shorter’s light still beams brightly. In memory of those who went before us, in honor of those whose hearts are with us, but who stayed to care for our students, in remembrance of the darkest day in Shorter’s history we have requested that those who were there when the light was hooded and truth distorted remember with us. We say to Don Dowless, Nelson Price, Bob White and the Board of Trustees of OUR Shorter, OUR Shorter still lives! We are not going away, we will not be deterred in our determination to restore OUR Shorter to her former glory, WE WILL NOT BE MOVED! The Shorter College we knew for over thirty years was a place where the search for knowledge and the quest for a right relationship with God were both valued. Faculty members like Philip Greear, Wilson Hall, Meighan Johnson, Jenny Davis, my husband Peter DeWitt and so many others taught students to use the brains that God gave them and broke new ground themselves. Religion faculty like Joe Baskin, Robert Nash and Rob Wallace taught out of generous hearts that put Christian love ahead of Pharisaic legalism. Faculty enjoyed freedom of thought, from Wilson Hall, the self-proclaimed “Daoist Christian”, to Steve Krosner, the observant Jew, to various people who eschewed organized religion. Students were encouraged to progress through natural stages of moral and intellectual development by a classroom environment that promoted the free exchange of ideas. Shorter was not a place of rigid rules limiting thought and practice. All that changed formally on October 24, 2011, when the Board of Trustees approved the statements of faith and lifestyle that faculty and staff would have to sign in order to be employed. Although I was stunned into silence at the time by the Provost’s remark that we should have seen it coming, I can now say, “No one expects the Spanish Inquisition.” Actually, he would have been right if we had been privy, as he was, to Board discussions. But we were helpless to prevent it once it had gained momentum. Some of us tried, but to no avail. Shorter is a closed book now for me, but I pray God’s blessing on those who left and those who stayed, and especially on those who continue to teach and work in an inimical atmosphere. I have been thinking of the ‘old Shorter’ since I attended Philip Greear’s memorial service on October 12, 2012. Philip Greear served as chair of the Natural Science Department from 1962-1985. A number of his former students were present, which speaks volumes for their regard of Dr. Greear. There are many such ‘former Shorter students’ who have the same regard for many other ‘former Shorter professors’. And thus the influence of the ‘old Shorter’ lives on. That is the hope and comfort for the future. It is difficult to describe the feelings I had about the statements at the time they came out. They each represented such extreme departures from academic norms that they did not quite register as real to me at the time. My initial shock has mellowed, if that is an appropriate word to use, into dismay. It is still difficult to believe that the school I once knew, the school to which I dedicated a considerable portion of my professional life, would abandon its principles and succumb to fear-based thinking. At a time when many are rethinking cultural and religious values, it may be tempting to those who are fearful of change, and who wish to preserve the status quo at all costs, to create static intellectual environments into which they can withdraw and feel safe. To establish such an environment, they believe, it is necessary to eliminate all threats, real or perceived, from within. Part of this process of threat elimination involves ensuring that no one in the environment harbors any thought that might challenge the accepted orthodoxy. This is exactly what has happened at Shorter over the past year. Orthodoxy has been established, heretics expelled, received truth is never challenged, and faith reigns supreme. The great irony, which few seem to perceive, is that in doing all this, the administration has unwittingly revealed its own lack of faith in its own principles. Think: would a person who truly has faith in the Bible and in the words of Jesus run away with his fingers in his ears anytime he heard a contrary opinion? Obviously, these are the actions of one whose faith is tenuous. Yet this is what the administration has done; this is the testimony it has presented to the world. It is said that fear is the opposite of faith. I would urge the administration of Shorter University to face down its fear of ideas, and to have enough faith to believe that Christianity is strong enough to withstand an encounter with the modern world. So much of my life has been influenced by my years at Shorter as both a student and professor. I will always be grateful for the wonderful students and colleagues that have become a part of the fabric of my musical and spiritual journey. No actions or distance will ever separate me from the love and support that I experienced there. I am grateful to my teachers, my beloved students, and my colleagues and administrators for showing me the full love of Christ. It is in their honor that I celebrate the love, joy, compassion, acceptance, and hope that is the centerpiece of the gospel of Christ. May God bless them and grant them peace. I spent 7 wonderful years at Shorter. I loved my students and my coworkers. Now, looking at what has happened, I can only say “I love my new job”. I pray that Shorter may survive and once again be a welcoming Christian College. Shorter was such an exciting place and a rewarding job for me. I LOVED getting to know the faculty, staff, and students. Watching our students move from classroom status to graduates, to working adults was such a treat. Most of the relationships I built at Shorter will remain intact for a long time. I prayed about my departure from Shorter and although my decision was not easy, it was the best decision for me. I no longer had faith in the leadership at Shorter. It broke my heart to see the demise of countless numbers of co-workers and to continue to hear the stories of fear from so many students. Although I have moved on and have gained fulfillment elsewhere, I think about Shorter and the students on a daily basis. It is my prayer that someone, someday will recognize what is going on and help bring Shorter back to where she used to be. One year ago today, my decision to attend seminary was solidified when my employer, Shorter University, announced that all employees would be required to sign a lifestyle statement that I could not endorse. May God bless my colleagues who made the difficult decision to leave, as well as those who remained. Remembering October 24, 2011, and thinking about all his former students and colleagues at Shorter College and St. Peter’s Episcopal Church. May God bless you wherever you are today. My Shorter was a place where the love of Christ truly did transform lives. It was place where all were welcomed, appreciated and respected even when there was profound disagreement. I am thinking about my former colleagues today, those who are gone from The Hill and those who are still there. May God’s peace be with us all. I was at Shorter as a student in the early 70’s and, much more recently, as music staff and adjunct faculty. As a student, I found Shorter to be a place rich with its own traditions, a place where I was challenged academically, and most of all, a place where I was loved by distinguished faculty and great students. Over 30 years later, I returned. Though there naturally were many changes, I rediscovered that familiar warmth of a loving family blessed by our Heavenly Father and by the wonderful heritage that was Shorter. I miss her greatly. One year ago, my life was turned completely upside down. At the time, I saw no light, and no positive outcome, but God had a plan. I can honesty say that I am thankful for the events that unfolded. Because of the events at Shorter, I was able to find my new home. I have never been happier, and more confident in my abilities as a person, and as a performer. God has a plan for my life, and it is a great one. He has me in the palm of his hand, and for that I am so eternally thankful! As I reflect on this past year, I am amazed. We created magic in the midst of such darkness and hatred. A year ago today the Lifestyle statement was released at Shorter. We faced a difficult time in our lives with a tremendous amount of courage. My faith was challenged, and I am stronger because of it. I believe that a relationship with God is about love and acceptance. Thank you to the 90+ faculty and staff members who stood up for their beliefs, left Shorter, and uprooted their lives. Thank you to those who stayed and are fighting to give students the experiences they deserve. Thank you to my friends and family who encouraged me through the past year. To Shorter and all of my beloved friends I made there, I miss you every day. I carry you with me always. Thank you to Reinhardt for providing a new home for so many people I love and for welcoming us with open arms. Shorter’s CAPP (College of Adult and Professional Programs) numbers are down – way down. The program was building steadily, albeit slowly (from 1917 in Fall 2007 to 2220 in Fall 2010) but had gone down slightly in Fall 2011 to 2006. The Fall 2012 numbers, however, show the CAPP numbers falling substantially to 1444. Why the numbers fall and what did does this mean to Shorter’s future success? One of the fastest growing market segments in higher education is the non-traditional student. No longer does education only belong to the young. Many adults are finding that the education that they received “way back when” is no longer enough to earn them a significant place in the jobs market. The old standard of being able to earn a good wage with merely a high school degree is gone. Today’s wage earner has found that most companies demand a bachelor’s degree for any job that requires more than manual labor. With more and more traditional aged students entering the job market with masters-level degrees, even those jobs with limited required skill-sets are requiring at least some form of higher education. To its credit, Shorter recognized this trend and in 1992, began its School of Professional Programs (SPP)in Marietta. In 2003, the university expanded their program to include other schools within the institution. Today, the old SPP program, now CAPP, boasts of campuses in North Atlanta, Riverdale, Gwinnett and Rome. Why did Shorter pursue the non-traditional student and create the SPP/CAPP program? The first answer lies in one word – demand. Lifelong learning is now a given and as more and more adults demand educational opportunities, wise colleges and universities rise to meet that need. The second reason is not as obvious. Shorter’s infrastructure is aging and aging rapidly. Buildings that were built fifty years ago or more require major funding to keep them in good repair. Old steam heat radiators must be updated or replaced, old floors, roofs, walls must be kept up. Like any older structure, the cost of upkeep is enormous, but those buildings are what makes Shorter appealing to so many of her students and alumni. Within their walls, the old buildings hold the memories of many generations that have walked those halls. Even with a “full house” enrollment, the upkeep often costs more than the revenue received through room and board. As schools reach a higher degree of diversity and sophistication, more and more administrators are deemed necessary to run the school. Staff too, has increased, with the addition of everything from athletics to the Internet. No longer are we in the days of Dr. Minor, where limited number of administrators and staff were necessary. To put it simply, Shorter had to expand in order to generate the income to support the Rome campus and the traditional students it attracted. Programs designed to reach the adult learner audience came at a relatively low cost to operate. There is no residential component, therefore no need for housing. Rather than investing in building a new campus, classroom and administrative space could be rented from one of the hundreds of office parks in greater Atlanta. Programs required minimal investments in faculty as well. Faculty are mostly adjuncts (less than 15% of all faculty are employed full time) who are hired on an “as needed” basis and are not paid benefits. Without the residential component, professional schools do not require the administrative staff that a residential campus does. Shorter’s administrators in the early 2000’s wisely knew that they could create the programs, but they needed strategic data-driven recruitment to market the program and to convert inquiries to enrolled students. 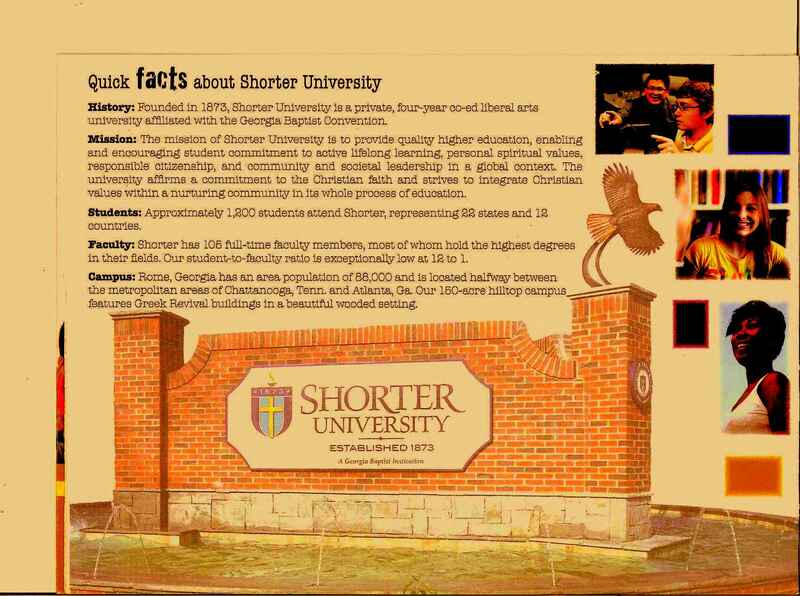 Like many colleges and universities, Shorter chose to out-source the marketing and recruitment. Soon, adults all over Atlanta heard Shorter radio ads, saw billboards, read ads that popped up whenever they searched the Internet for programs for the adult learner. For a while, the outsourcing worked fairly well. In 2005, enrollment in the Professional School was 1478. By fall, 2011, enrollment grew to 2006. The bonus of all the additional student revenue acquired with lower cost investment meant that CAPP quickly became vital to Shorter’s bottom line. In 2011, Shorter decided to make a change. Rather than change the company on whom they relied for marketing and recruitment, they chose to end out-sourcing entirely. To those who questioned that decision, assurances were made that Shorter had “millions” to do their own marketing and recruiting. That’s when Shorter shot its cash cow. The precipitous drop from 2006 students enrolled in the CAPPS program to its current reported 1444 –a loss of over 500 students and approximately $2-3 million dollars in revenue – should be a red flag for Shorter’s future. Trustees, take heed. The cash cow is dying because of very poor decisions. How, then, will you support the flagship campus? You have hired a new employee for your business. The employee comes with great recommendations from your primary stockholder. He made a good impression during the interview process. Your management team has assured you that THIS is the guy who can straighten out all the problems that have seemed to plague you recently. Of course, you didn’t bother to do serious reference checks, nor did you go through a proper employment agency to find this guy, but you have no need to worry. After all, your stockholder has reviewed all of the applications and has assured you that this is the candidate that can work a miracle for you. The employee comes on board and immediately proceeds to clean house. Out goes your traditional model. In comes his “new, improved” version. Of course, he hasn’t taken the time to understand exactly what has made your business so successful. He hasn’t talked to stakeholders in your business, nor has he consulted with your employees to determine how your model operates, what its strengths and weaknesses are, or who your consumers are. All he needs to know is that he is in charge and your stockholder (who has no experience in your industry) is backing his decisions. He has promised you that all of his changes will deliver. You won’t lose sales, you won’t lose your stakeholders, you won’t lose significant employees – you’re going to see overwhelming success. What do you do when he not only fails to deliver, but fails miserably and you realize you’re being manipulated? After all, he never fails to tell you what you want to hear, but things aren’t looking too good. Final Fall enrollment numbers were announced on the Hill this week. The administrators on the Hill make interesting use of semantics. In an article on the Shorter website, dated September 6, it was reported that “1528 traditional students are currently enrolled at Shorter”. The problem is, that report is not quite accurate, nor does it reflect the real state of the institution. From the announcement, one might logically assume that there are 1528 bodies on the Rome campus. That would be an erroneous assumption. The report of 1528 TRADITIONAL students combines the traditional students – 1211, plus the online students – 317. The announcement goes on to say “This is the third consecutive year that Shorter’s fall enrollment as topped 1,500.” Well, not so fast, Dr. Dowless. Let’s examine that claim. Here are the Fall enrollment numbers from the 2011-12 Fact Book. Prior to 2009, Shorter had no online programs. Though entering late into the online or distance education business, Shorter’s administrators realized that there was a vast market of students of all ages who lived nowhere near the Rome campus who were potential source of much needed income. In June of 2009, Shorter began offering an array of online general education courses but no 100% online degree programs. In Fall 2010, Shorter reported 1555 Main campus students and 107 online students. The following 100% online degree programs were offered: Associate of Science (AS), Bachelor of Business Administration (BBA), and the Masters of Accountancy degree. While some of the Fall 2010 online enrollment might be attributed to off-campus students, since the program was new and relatively unknown to outside markets, the vast majority of fall students were still on-campus (traditional) students in hybrid programs which offered both on-line and on-ground courses. It made sense, then, to combine the numbers of actual bodies on the Shorter campus with the numbers enrolled in the Online Program under the MAIN category. It is important to note here that in academia, students under age 23 are considered “traditional” students, while the students over age 23 are considered NON-traditional students. Since the stand-alone number of non-traditional distance education students (those over age 23 and not on the Shorter campus) is not reported, we have no way of knowing how many of the 138 online students reported in Fall 2011 fall into this category, but since we know that Shorter was already bursting at the seams with residential students, it must be assumed that at least a portion of those reported fall into the non-traditional and/or off-campus category. The gain that was reported was not significant enough to create a separate category for distance students and so the number was again incorporated into the MAIN category. The Fall 2011 enrollment is reported as 1696 in the MAIN category. Even if we attributed all of the Online Program numbers as non-traditional/distance students, Shorter still had 1558 students on the campus. That’s 1,558 traditional, residential students on the Rome campus. There are not 1,528 traditional students enrolled in Shorter this year. There are barely 1,200. That, dear readers, points to a loss of approximately 300 students from the Rome campus alone. What we find interesting is that Shorter seems to confirm that number in a collection of brochures that we have obtained from potential students for an event known as Saturday at Shorter. The April 2012 event indicates a student body of 1500. The October 2012 event indicates a student body of 1200. Just to assure yourselves that this is not a typographical error, note that the teacher/student ratio in the April brochure is 1/13, the October brochure reads 1/12. Try multiplying 300 times $27,400 tuition per year. That’s a significant loss of income to a business. Try imagining the effect of losing close to a quarter of your business inventory. Losing 300 students is a far cry from the loss of only 167 students that one employee reported to his employers. Try misleading the marketplace, your stockholders, your stakeholders, and your employer with numbers that don’t match the real state of your business. And we haven’t even looked at the CAPP numbers yet. Stay tuned. A couple of years ago, I heard a Baptist minister speak of how we have our public lives and our private lives. The premise of the message was how we often may look like we are doing things the right way publicly but behind the scenes, when we are alone, things are quite different. We feel, think, and do things that are just flat out wrong – the antithesis of our appearance to the rest of the world. My father also had some quips he would use to describe some qualities of people who interacted publicly quite differently than the way they really were in private. “Putting on airs” was one, “Boring with a big auger” was another. “March” was a name I heard to describe someone who would brag and boast with so much exuberance one would think of the March winds flowing from their mouth! As explained previously on this website, the new faculty do not have the overall seasoning or available mentorship from established faculty to be as effective as is required to prepare students for life after Shorter. However, all that is trumpeted publicly is how the quality of education on the Hill is improving. Privately, there has to be some semblance of concern about the mishmash of new Deans leading the legions of new faculty, unless the tin ear that is extended to alumni concerns is also lent to faculty and matters of learning. Speaking of students, all we hear publicly is how everyone is happy while skipping amongst the gardens and studying under the trees in front of the new multimillion dollar Nelson and Trudy Price Learning Center, while a gentle breeze may inspire other students to nap or throw a ball. Oh how great it seems to be a student getting educated behind the pearly gate of Shorter Hill. Privately, it is quite a different matter. Some students, especially Juniors and Seniors, are expressing legitimate concerns about the education they are receiving. Disorganization among faculty is rampant. The students feel as if they are on a rudderless vessel. How will this haphazard teaching and leadership help the students get into grad school or pass their boards? Why does Dowless and Company engage in bragging about the blessings of Shorter? Why are they “putting on airs” about the quality of education and student life on the Hill? It seems they are “boring with a big auger” through constructing new dorms and negotiating to purchase more property, seemingly to prove they are acting boldly and moving forward with the “new” way of doing business at Shorter University. Actually, this “new” way of doing business is REALLY what the private life of Shorter is all about. The condescending attitude to pre-existing faculty and staff is a quality of the new private way. A power structure that flows from the president and Nelson Price, instead of through normal administrative channels that are in place at other institutions of higher learning is a quality of the new private way. Hiring faculty and staff without consulting the human resource department is the new private way. Pulling enrollment figures seemingly out of thin air is the new private way. These are ALL things that the public are not to see or to hear of happening. How many of the trustees are only listening and paying attention to the public life of Shorter? There is a board of trustees meeting that will be occurring shortly. Surely there must be one, two, or more that would dare to step forward and do their fiduciary responsibility. Surely at least one will look beyond the press releases, and discover what is going on in the private life of Shorter. They need to ask the hard public questions and search out the shadowy private answers. Those in authority may tell any curious trustees to “Pay no attention to the man behind the curtain”… but that man is a story for a different day. REPLACEMENT SCIENCE DEPARTMENT WORSE THAN REPLACEMENT REFS? Before the academic year began, we warned our readers that Shorter’s hiring of individuals with no terminal degree, who had not taught in college or who, in some cases, had no teaching experience at all would be costly to students. The National Football League just learned the consequences of hiring poorly trained substitutes for their games. That poor decision raised the ire of the fans, caused doubt in the final scores of games, confused the players and had owners and managers up in arms. At the moment, the students of the former School of Science, now the Department of Natural Sciences are paying the price of poor hiring of replacement faculty that is reflected in what can only be described as barely suppressed chaos on the Hill. Think, for a moment, of a business or university, in this case, in terms of the work staff. Most companies (and colleges) realize that there is importance in retaining a balance in the workforce. Long-term employees hold a historical memory of the institution. They provide context for ideas and improvements in the business. They act as mentors to new employees. They know what works, and what doesn’t in their field and they help guide new employees toward success at the institution. Of equal importance is the stability that they provide to the institutional workforce. Mid-range employees are generally the breeding ground for potential management. Mid-range employees are often tested with more responsibility. It is often where the owner of the business or institution determines the true value of an employee as a long-term hires. In academia, the value of mid-term employees is expressed in tenure. If a professor seems to be a fit for the institution and provides the expected excellence in teaching, they are placed on what is known as tenure track. Due in large measure to the actions of the GBC, Nelson Price and the Dowless administration, resignations were high and costly in the School of Science. Good managers know that when you lose key personnel, you work to replace those individuals with others equally skilled for the positions. Unfortunately, Dowless and company are not good managers. As a result, the Dean of Arts and Sciences has no background in science, the associate dean of sciences holds only a Master’s degree and most of the new faculty either don’t know their subject matter or don’t know how to teach – or in some cases, are guilty of both. When nursing faculty are telling students that deoxygenated blood is blue (look it up, it’s a myth), when ecology professors believe and teach that salmon spawn in estuaries, it isn’t the result of a re-alignment with creationism, this is just egregious academic instruction. When ecology classes stay indoors and when newly-hired professors consider themselves exempt from the long-standing and strictly enforced policy of absolutely no cell phone, including texting and no hand-held communication device use during the weekly science seminar, something is seriously amiss. Students are crying out to those of us who will listen. They deserve to be heard. Juniors and seniors, especially, know that their success in grad school and in the nursing field depends on receiving accurate information. They know that if they perform poorly on grad school entrance exams or fail their nursing boards, then their time at Shorter is for naught. They go to the faculty for help, and despite Shorter’s open door policy, they find the new faculty either not in the office or holed up behind closed doors during office hours. Many of their questions are in regard to the syllabus for the class. A syllabus is a contract between professor and student. The professor lists texts to be used, clearly delineates the course expectations and outline, explains the grading system for the course and assigns point value to each of the components (tests, exams, in-class participation, research papers, extra credit, if available). Syllabi provide context for the student and lets them know what is expected of them in order to earn a good grade. It seems that with some new professors, the guidelines of the syllabus are being ignored or arbitrarily changed. We are also hearing reports of revised and often arbitrary point assignment, testing on materials not taught in class or assigned and last-minute availability of online exams. In other words, the professor is breaking the contract with the student. To add to the tension, there are wide-spread allegations of cheating. Students tell of being accused of stealing exams in order to sell them. The exam was later found by the professor in a stack of graded exams. Other students are being accused of cheating on exams or assigned work. Why does this suddenly seem to be a problem on the Hill? These sorts of accusations are extremely serious and should be of concern to the administration. When the accusations are false, that is a glaring failure in professional behavior of the faculty and the administration who hired them. In other words, the NFL fiasco looks like a cake walk compared to what students on the Hill are experiencing. Students, don’t give up – it is your education that is at stake. You have a voice. Document the class, date, time, other witnesses and a description of the complaint. Follow protocol and work your way up the chain of command. If the professor isn’t listening, go to the department chair. If you receive no satisfaction there, go to the Assistant Dean of Sciences. Dr. Sabrena Parton is the Dean of the School of Arts and Sciences.. Address your complaints to her, in writing. File a formal complaint with the Dean of Students or Provost, if necessary. Be aware that there is a written policy which addresses your fear of retaliation against you. The process is tedious, but if you follow procedure, file a written complaint and receive no satisfaction, let your parents know. Shorter is required by SACS to keep a record of all complaints, including student complaints, faculty complaints and outside complaints, and document their resolution. And remember – we are listening.